‘Z’ BEFORE ‘E’ ‘CEPT AFTER…. Earlier this week I was waiting for my grandson in the usual spot when a smaller white van pulled into the field behind the playground. This time two men in hi-vis vests crawled out and walked to the climbing incline. One of them spun a letter. Déjà vu…it was the ‘e’ again. I can understand that. The letter ‘e’ is the most used and often abused letter in the English language so I can see that he would go off his nut more so than his twenty five brothers and sisters. I watched as, once again, one fellow walked back to the van to get a wrench while the other stood guard. I wondered why there were only two guys this time. Maybe they knew it was that rascal ‘e’ again and knowing that ‘e’ is generally a soft letter they figured they wouldn’t need all the backup that they’d sent out the first time. Ah…that first time. Seems to me something like this should only require a first time so perhaps they should be rethinking the repair. 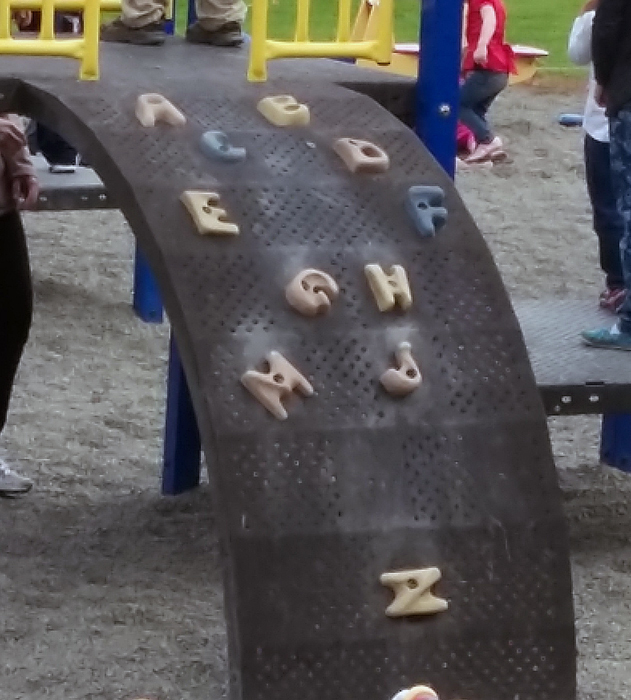 My suggestion would be to replace it with a lesser-used letter…like ‘z’. Kids don’t use ‘z’ as much as they use ‘e’ so that should solve the problem. Maybe not…but a 5 cent locking washer might…or even a shot of Loc-Tite. I assume either solution would be cheaper than sending two or three guys out to tighten a nut. Even with the reduced manpower this time the ending was the same as the first. A quick twist of the wrench, a spin test, and then off to tackle the next catastrophe or get a coffee to celebrate a job well done. See ya next month boys! Okay, silly rant over. I leave you with a link to Patrick Jones’s blog. Patrick is another that has always supported me even to the extent of promoting ‘Barking at Yesterday’s Moon’ before I had uploaded it. I invite you to check him out but pour a coffee before you do. He has so much entertaining and informative content on his site that it could take you a while. Thanks Patrick!!! This entry was posted in barking at yesterday's moon, independent author, Off Topic, Random Thoughts, Self Published, white wolf moon and tagged letters, playground.